quinoa recipes, Indian quinoa recipes, healthy quinoa recipes. Quinoa has been termed as the superfood of the era. Unlike most grains, this super protein rich ingredient has all the nine essential amino acids including the lysine, thus being a boon to vegetarians. When we refer to as quinoa, it’s the seeds that are the edible part of the plant which we consume. These are gluten-free. Yes, quinoa works really well for Indian food. Traditional Indian upma recipe is made of semolina and not healthy as rava is used. Read is rava healthy? Try this Quinoa upma recipe which is made with onions, green peas and carrots to add more fibre and is gluten free. The classic dosa recipe used rice and urad dal. While it is healthy, it is not the perfect dosa to have as it contains rice. Read is dosa healthy? Have this quinoa dosa recipe as it contains ZERO rice and is super healthy. Made with quinoa, urad dal and whole wheat flour. The Gujarati snack Muthia has now been innovated to quinoa muthia recipe with the usage of quinoa. We have made the traditional Indian khakhra recipe even healthier by using quinoa and red chawli leaves in quinoa red chawli leaves khakhra recipe. Quinoa increases your energy levels as it is rich in protein, while red chawli leaves are loaded with iron, potassium and vitamins C and Vitamin E.
Another good variation is Quinoa kale khakhra which has the addition of oats flour and kale to make it a very healthy snack which we have in our office. So carry this with you to work instead of munching on refined foods. Quinoa : Quinoa lowers cholesterol and reduces heart diseases. The soluble fibre in this grain gains the credit of reducing the total blood cholesterol and LDL (bad cholesterol) levels in our body. Harnessed with nutrients like protein, calcium, phosphorus and magnesium, quinoa has been considered as the bone-building power grain. Quinoa has potassium and magnesium – the two key nutrients which help to lower high blood pressure. See detailed benefits of quinoa. 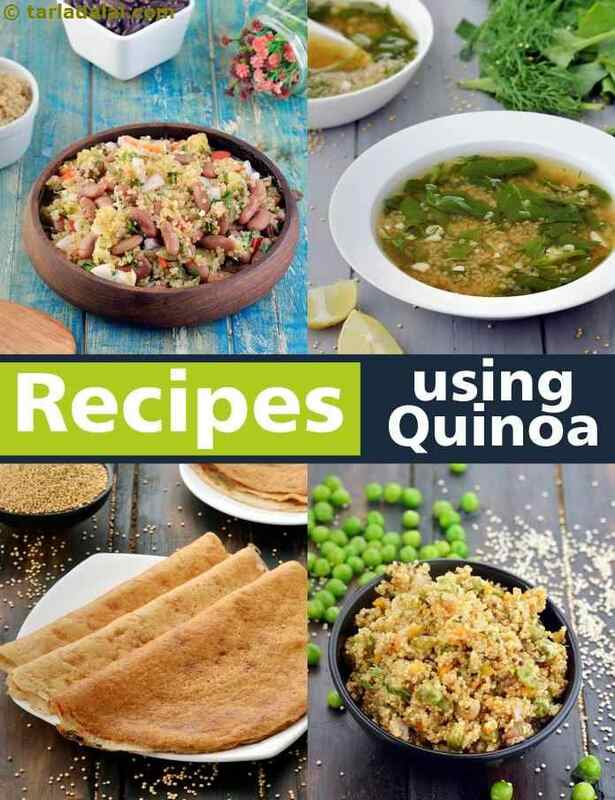 Enjoy our quinoa recipes, Indian quinoa recipes, healthy quinoa recipes below. Beets Arugula and Quinoa Salad is a simple variation to a Summer Buckwheat Salad that you might have tried. It’s a beautiful colorful salad bursting with greens, oranges and reds, just perfect to brighten your day.